Painting can be such a tactile experience. I encourage my young artists to experiment with textures and explore how things feel. This creates wonderful conversations about how things feel: hot, cold, squishy, slimy, scratchy. Here Fiona and David are learning about warm and cool color combination's. They titled their combined work "an explosion at a chocolate factory"... 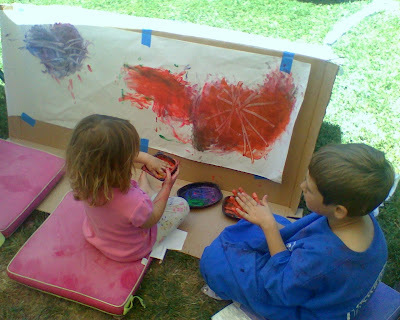 It may be fun and messy, but it is the perfect way for them to explore the materials. Check out my other Children's Art Lessons & Suzanne's Summer Studio... I offer a variety of classes for children of all ages. Thursday Night Studio - 7pm - 11:00p.m. - Variety of topics and mediums. Contact me directly for details.